We are dedicated to working with patients to overcome any obstacles that are preventing patients from having proper dental care including financial. We provide affordable dental care, and aim to treat all patients fairly. We’ll find a flexible payment plan that meets your needs. No Insurance? No Problem. We offer discounts to patients without insurance. Here at Dr. Norma Vazquez DDS we are devoted to restoring, preserving and enhancing the natural beauty of your smile, We promise a thoughtful and conservative approach to your dental care, and we will concentrate solely on you as an individual. We want you completely understand your dental needs and the option you have to address those needs. Our approach is to focus on the methods of preventive care and that will allow you a great opportunity for a long lasting dental health. 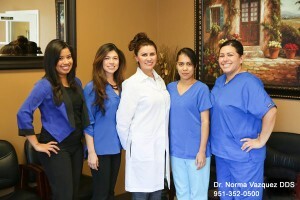 Dr. Norma Vazquez has been providing excellent dental services for the past 17 years. She began her dental career at the University of Sao Paulo in Brazil . She worked in Brazil for a few years then came to the United States and attended Loma Linda University and graduated with her DDS degree in 2006. She could not have made a better career choice. Dr. Norma Vazquez has a very gentle and caring chair side manner, which makes her patients feel very comfortable and eager to return for all their dental needs. She takes pride in her work and makes sure that she provides the optimum dental treatment planning for her patients. Furthermore, she values her patient’s main concerns and does all that she can to meet her patients needs. She currently opened her own dental office in Riverside and already sees the ample rewards of being a dentist. Dr. Norma Vazquez is looking forward to providing her best care to you and your loved ones.